Here we are with another mega-load of cooking. This recipe yielded 15 cups of tomato sauce that I'm excited to use for dishes such as Spanish Rice with Shrimp, Fusilli with Chicken and Tomato Sauce and home-made Calzones. Now, doing this in Korea posed a couple of challenges. First of all, I'm not sure if anchovies exist but I went a head and purchased some canned fish with fingers crossed it'd be similar to anchovies...pretty sure it wasn't. BUT, of course I used it anyway, because that is simply how I roll in my kitchen. Anchovies (or other canned fish) are ultimately optional, if I do this dish again, I'll probably opt out. The other challenge, in my kitchen anyhow, was opening the giant can of whole tomatoes. I always knew our can opener wasn't top notch but seriously, things got ugly and after about 30 minutes and a new can opener, I finally got the stupid can open. I can't imagine you'll have to face that challenge. In a 5-6 qt. heavy dutch oven combine 1/4 cup Olive Oil, 8 smashed cloves of garlic, 6 oil-packed Anchovy Fillets chopped and 1/4 tsp. Crushed Red Pepper. Cook over medium heat until garlic is golden and anchovies disintegrate (3-4 minutes). 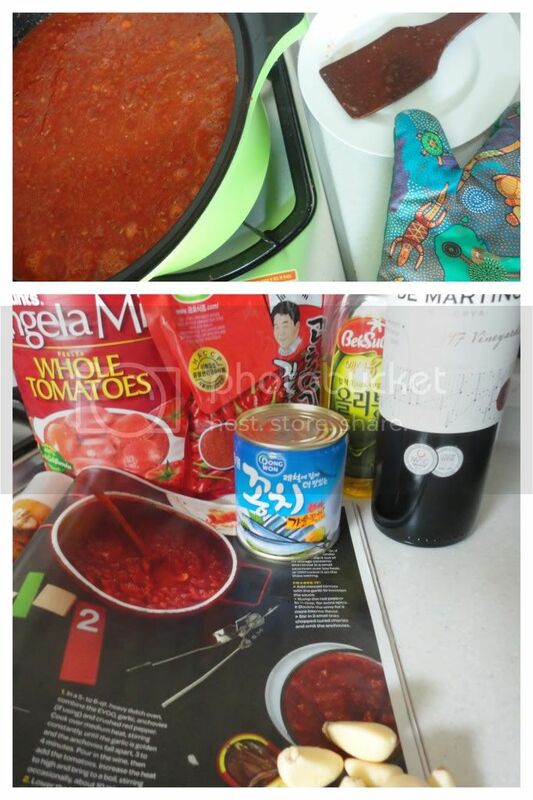 Pour in 1 cup of red wine and 4 cans (28 oz) of crushed tomatoes (I had the luxury of using canned whole tomatoes in a 2 lb. can which then had to be 'crushed' with my handy-dandy immersion blender...so just use a lot of tomatoes). Bring to a boil and let boil about 10 minutes before reducing heat. Cover part-way and simmer until the sauce is thick (about 2 hours) Stir occasionally. Season with salt. Cool and store in 1 or 2 cup portions in Ziploc baggies in the freezer!